Join Team Lightning and Weed Wrangle®-Nashville for a community service event! 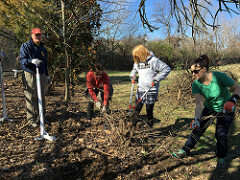 Weed Wrangle®-Nashville, is a one-day, citywide, volunteer effort to help rescue our public parks and green spaces from invasive species through hands-on removal of especially harmful trees, vines and flowering plants. Come help remove these invasive-exotic plants which are damaging the natural environment near Two Rivers Park. We will be partnering with the #GrowGoats to help keep our greenways healthy and thriving. You pick 'em, the goats will eat 'em! Difficulty: Open to all ability levels. Work may be strenuous, so be prepared to bend over and pull weeds! Registration Deadline: The deadline to register for this event is Thursday, February 28th at 3:00pm. Children Policy: Open to ages 10 and over with parental supervision. Weather Policy: Dress for the weather--rain or shine, we will wrangle weeds!